Added by Indo American News on April 5, 2019. The keynote speaker, Dr. Aparna Kamat; Special Guest, Judge Juli Mathew and guest, Dr. Heena Thakkar (from right to left) commemorate the start of the conference in a traditional manner by lighting the divo. 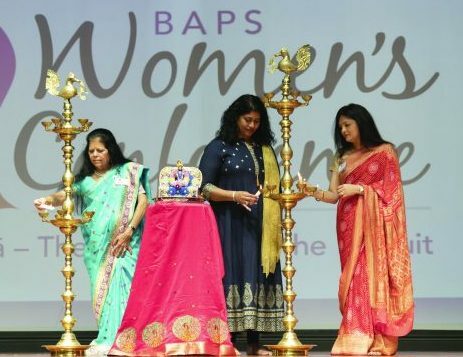 STAFFORD: The BAPS Shri Swaminarayan Mandir hosted over 1,100 women at its 13th annual Women’s Conference on March 30, 2019. Centered on the topic of “Sādhanā: The Purpose and the Pursuit”, the conference brought together women of all different ages and backgrounds to engage in a dialogue relevant to all. Special guests in attendance included Dr. Aparna Kamat, Director of Gynecologic Oncology in the Department of Obstetrics and Gynecology at Houston Methodist Hospital, as the Keynote speaker and Judge Juli Mathew, Fort Bend County Court #3 as the Guest of Honor. Also in attendance at the conference were members from over 15 fellow Indian organizations from around the Houston area. Sādhanā means the efforts towards our goals. Through discussion around hopes and goals, individual purpose and priorities, the conference presented an insightful look at the various efforts everyone partakes in while highlighting the integral Sādhanāof spirituality. Starting the conference on the right note, keynote speaker Dr. Aparna Kamat, noted the importance of hope and passion in pursuing Sādhanās in all aspects of life and the role of perseverance and humility in the process. She encouraged members of the audience to make a choice to be the best version of themselves through their Sādhanā. The definition of Sādhanā that most resonated with her was, “Sadhana is a personal process in which you bring out your best”. The opening portion of the conference focused on identifying the various Sādhanās, or efforts that are a part of everyday life. The opening speaker, Mrs. Hiral Patel, shared through her own ambitions and goals, how she strives to achieve balance among them, while aiming to keep one Sādhanā at the forefront. Highlighting how spiritual Sādhanā can elevate a person to a new level, by building faith and perseverance, teaching self-awareness, helping understand true fulfillment from within, and creating a more compassionate spirit, she emphasized the importance of focusing time and energy in building spirituality. The second portion of the conference focused on the “how” of strengthening one’s personal spiritual Sādhanā. Ms. Anita Patel shared how making slight shifts in perspective, incorporating small changes to daily routines to include spiritual practices, and finding time in everyday tasks helps make the pursuit in building spiritual sadhana a natural part of life. She provided practical examplesand action items that the audience could walk away with to move forward on the path of spirituality, no matter their starting point. Through her talk, Ms. Patel simplified the seemingly difficult concept of spiritual Sādhanā into everyday achievable steps. Throughout the conference, audience members were encouraged to take part in an interactive reflection activity. Questions around the topic of Sadhana were presented on the screen and audience members were asked to take part first in personal reflection and then share their answers via a live polling system that was shared with the greater audience. This allowed for attendees to gain inspiration and learn from each other’s reflection and thoughts as well. Through this activity, attendees were able to play an active role in the dialogue presented by the speakers. The BAPS Women’s Conference was inspired by His Holiness Pramukh Swami Maharaj and encouraged by His Holiness Mahant Swami Maharaj, the current spiritual leader of BAPS Swaminarayan Sanstha. The conference highlights the influential role of women in today’s society and also empowers the younger generations by promoting a healthy dialogue around current topics. Before and after the conference, attendees had the opportunity to network with others from the greater community and share their perspective on the talks of the day. Many in attendance felt inspired by the conference and conveyed their motivation to share the word with their family and friends.